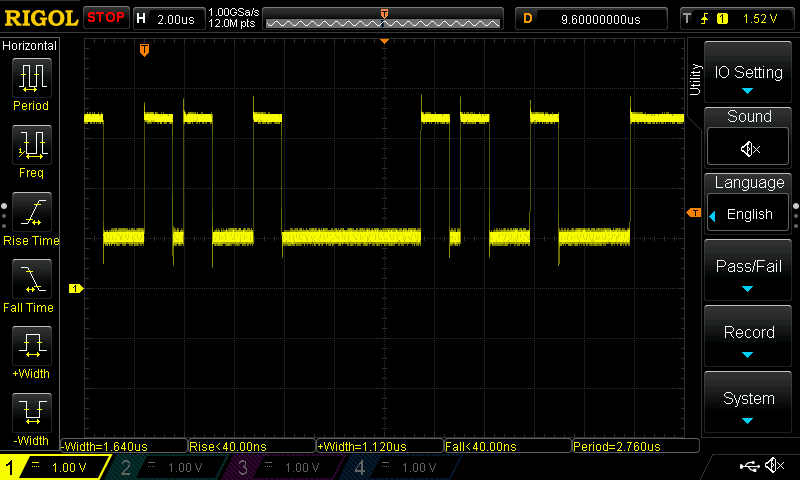 Since I finished writing the fastest possible bit-banged SPI for AVR, I wanted to see how fast the ESP8266 is at bit-banging SPI. The NodeMCU eLua interpreter I initially tested out on my ESP-01 has little hope of high-performance since it is at best byte-code compiled. For a simple way to develop C programs for the ESP8266, I decided to use ESP8266/Arduino, using Jeroen's installer for my existing Arduino 1.6.1 installation. Starting with a basic shiftOut function that worked at around 640kbps, I was able to write an optimized version that is six times faster at almost 4mbps. This change increased the speed slightly to 770kbps. Suspecting the overhead of calling digitalWrite as being a large part of the performance limitations, I looked at the source for the digitalWrite function. If I could get the compiler to inline the digitalWrite function, I figured it would provide a significant speedup. From my previous investigation of the performance of digitalWrite, I knew gcc's link-time optimization could do this kind of global inlining. I enabled lto by adding -flto to the compiler options in platform.txt. Unfortunately, the xtensa-lx106-elf build of gcc 4.8.2 does not yet support lto. This modified version was much faster - the oscilloscope screen shot at the beginning of this article shows the performance of shiftOutFast. One bit time is 262.5ns, for a speed of 3.81mbps. This would be quite adequate for driving a Nokia 5110 black and white LCD which has a maximum speed of 4mbps. While 4mbps is fast enough for a low-resolution LCD display or some LEDs controlled by a shift register like the 74595, it's quite slow compared to the 80Mhz clock speed of the esp8266. Each bit, at 262.5ns is taking 21 clock cycles. I doubt the esp8266 supports modifying an I/O register in a single cyle like the AVR does, but it should be able to do it in two or three cycles. While I don't have a proper datasheet for the esp8266, the Xtensa LX data book is a good start. Combined with disassembling the compiled C, I should be able to further optimize the code, and maybe even figure out how to write the code in lx106 assembler. Have you seen the GPIO_OUT_ADDRESS register? It acts like a "port" allowing you read/write all GPIO 0-15. Sixteen uses a different register. I looked at the code disassembly, and the GPIO_REG_WRITE(GPIO_OUT_W1TC_ADDRESS, X) compiles to a single instruction. Same thing for GPIO_OUT_W1TS_ADDRESS for setting, so I can't see any benefit to doing it differently. Take a look at this SPI lib https://github.com/MetalPhreak/ESP8266_SPI_Driver. 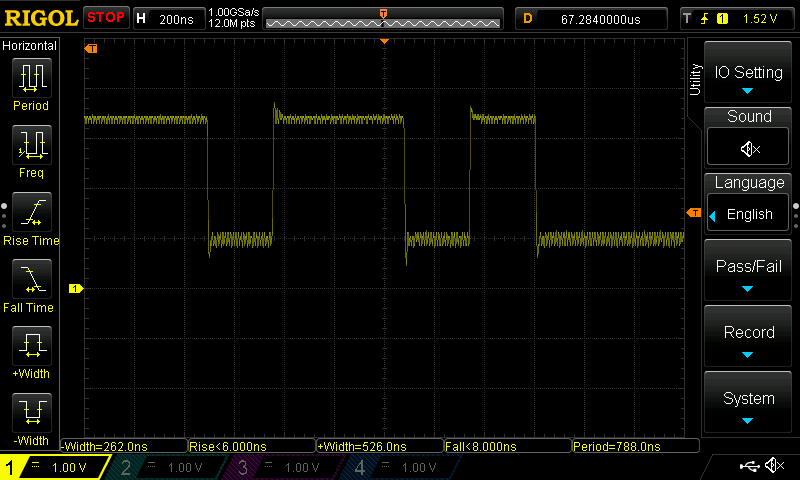 I got 16mbits after optimizing the spi_transaction function (moved spi register setup to a second method). 16mbps is pretty good. I haven't done much low-level esp8266 work lately, but I think 10mbps is feasible for bit-banging when running the MCU at 160Mhz. I find the spi_transaction function unnecessarily complex. Abstracting away the command/address/data and just having data out and data in would be better IMHO.